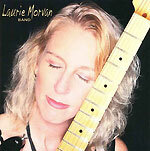 CD review: "Cures What Ails Ya"
L.A.'s Laurie Morvan is a member of that still all-too-rare club of female lead blues guitarists. On her third release, Morvan shows strong chops on guitar and a good ear for writing accessible songs. The overall result is an easy-to-listen-to blues-rock hybrid, not so different from what better-known artists like Robert Cray and Bonnie Raitt have been creating for the last few decades. While Morvan credits the late Stevie Ray Vaughan as a specific influence, her playing is far more reminiscent of former Roomful of Blues guitarist Ronnie Earl. It's got that Texas twang, but with a jazz musician's restraint and even elegance. She's far more interested in playing well than in playing fast. As a singer, Morvan sounds a lot like Louisiana swamp blues singer Marcia Ball. She doesn't show much range here, but has a nice growl and warm tones. And for someone who lives in SoCal and grew up in Illinois, she's sure got a drawl to her singing.